The duo gets an introduction from fellow comedian Archie Campbell. 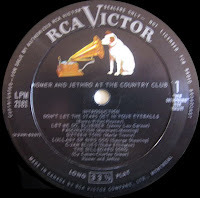 Following Archie’s intro (along with a short bit of sax from Boots Randolph), there are a few jokes from the duo before they break into one of their standards, “Don’t Let The Stars Get In Your Eyeballs”, a humorous take on “Don’t Let The Stars Get In Your Eyes”. Under the guise of Homer & Jethro, “Let Me Go, Lover”, becomes “Let Me Go, Blubber”, where Jethro feigns being mad at Homer for talking over his instrumental part. 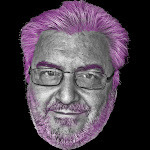 The song, “Fascination” is also worked in. Perhaps the best cut on side one, is their disassembly of “16 Tons”. Some great lyrical “adjustments” on this one, that are pretty funny. 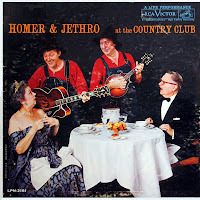 Homer & Jethro are legendary country funnymen, but they were also quite accomplished musicians, as “C-Jam Blues” shows. It’s a smoking instrumental in the jazz fold, featuring the sax of Boots Randolph, along with Jethro’s stellar mandolin playing. Following some comical banter with the audience, the duo wrap side one with their hit “The Billboard Song”, where they stopped after the first verse, for some comical bantering, that includes some good humor, not to mention the song, itself, that tells of comical consequences that resulted from a storm tearing away parts of billboards to reveal various ads which result in unintended tags, such as “…drink Wrigley Spearmint Beer”. Side two opens with some more jokes that are pretty good. Song-wise, things open with their parody of “Yellow Rose Of Texas”, which is titled, “Yaller Rose Of Texas, You-All”. “Battle Of Kookamonga”, of course, is their famous parody of “Battle Of New Orleans”. Arguably their biggest hit, as it was a top twenty pop hit, it also includes a few seconds of “San Antonio Rose”. One has to chuckle at them getting the crowd, which apparently included several celebrities of the day, to bark along on “How Much Is That Hound Dog In The Window”. The song, itself, is one of the great novelty songs of country music history, becoming a top five hit in 1952. The song also answers the age-old question, “Can a guitar be funny?” For that answer, you’ll have to get a copy of the album and see. Also, listen to how Jethro integrates “Skater’s Waltz”. 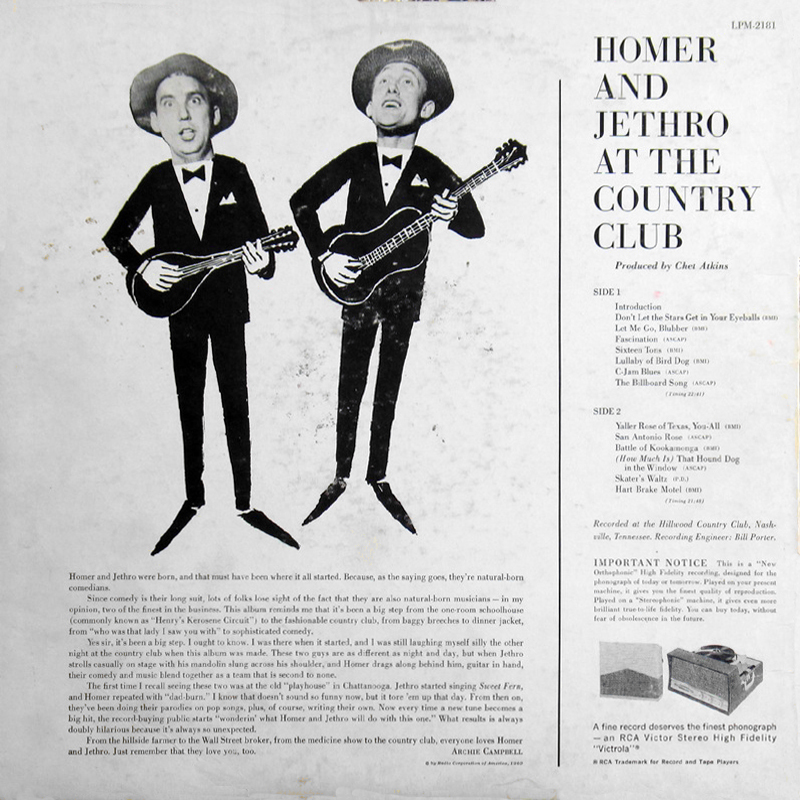 Following some more comical banter, including some good lines from Homer, the two wrap the album with their take on the Elvis classic “Heartbreak Hotel”. 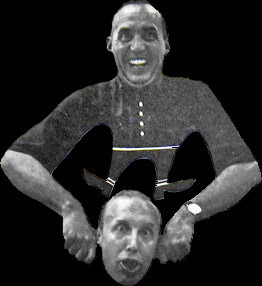 Titled “Hart Brake Motel”, one could argue it’s the highlight of side two, despite the presence of their two big hits. Some really witty lyrical work, right here. Not available on CD, though I think it would be a good one to release, it seems to be pretty numerous, as far as used copies go. Most of them going between $4 and $25, in both stereo and mono versions. As for the Standout Track, I will go with “How Much Is That Hound Dog In The Window”, while the Hidden Gem goes to “Hart Brake Motel”. You won’t find a Weakest Track on this disc. 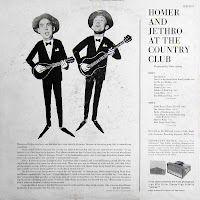 *Live at the Hillwood country Club in Nashville, Grandpa Jones vocals, Chet Atkins produced. 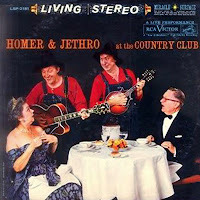 0 comments on "Homer & Jethro - Homer And Jethro At The Country Club 1960"